This pomegranate green tea with chia is a refreshing and nutrition-packed drink perfect for anytime of year. Can easily substitute a different tea or juice instead of the ones listed. If I had to pick a favorite superfood, it would hands down be chia seeds. It’s not that they’re necessarily better than any of the other superfoods, just that they are so versatile and simple to incorporate into my daily diet. From chia pudding, to oats or smoothies, chia seeds are easy to add to many foods and are jam-packed with fiber, protein, omega-3’s, and beneficial vitamins and minerals. Graze is an awesome company who delivers wholesome subscription snack boxes right to your door. They also have an online store where you can purchase unique snacks, individual ingredients, and they’ve recently expanded to offer a new line of superfoods, including acai, cacao, and baobab! However, when they invited me to choose one of their new superfoods to try, I didn’t hesitate to pick chia seeds. Like I said, they’re my favorite! I also knew exactly how I wanted to use them—to make a yummy and refreshing, nutrition-rich chia drink! If you enjoy chia pudding, then you must try this drink! It’s similar to the ones you’ll find in stores, but less expensive, easily customizable to suit your own taste, naturally sweetened, and doesn’t contain additives or preservatives either. 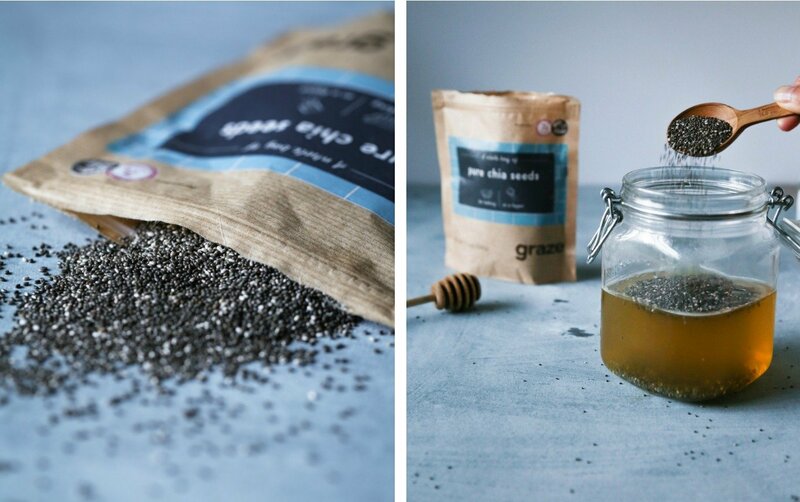 The most important step in making this chia drink is to gel your seeds first so they evenly disperse into the juice. 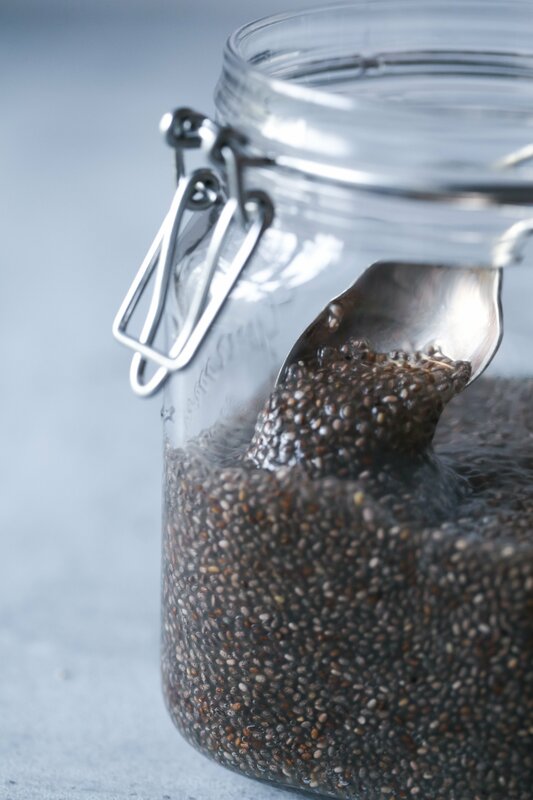 When chia seeds come in contact with liquid, they expand and can hold ten times their weight, becoming gelatinous in texture, similar to tapioca. It’s important to let the chia fully gel in the liquid until its thick and pudding-like, which helps them float in the juice instead of sinking right to the bottom of the glass. For this drink, instead of gelling chia in water, I used freshly brewed green tea. The green tea bags from my Graze snack box worked perfectly and had such wonderful flavor. If you’re not a fan of green tea, feel free to use any other tea, water, or juice of your choice. This drink is so delicious and refreshing, perfect for sipping throughout the day! It’s also a great way to get extra fiber and nutrients without tasting “healthy.” Change it up by substituting your favorite juice for the pomegranate in this drink. You can even try it with your favorite plant-based milks—Doesn’t chocolate chia almond milk sound yummy?! I hope you give this recipe a try! Don’t forget to check out all of the yummy snacks, treats, and ingredients that Graze offers on their website as well. Enjoy! A refreshing and nutrition-packed drink perfect for anytime of year. Can easily substitute a different tea or juice instead of the ones listed. Combine warm water and 2-3 teabags (depending on how strong of a green tea flavor you want in your drink) in a heat safe glass. Let steep for 3-4 minutes, or until tea flavor is pronounced. Stir in as much sweetener as you like (keep in mind how sweet your pomegranate juice is. You can always add more later) along with chia seeds. Stir thoroughly so that no chia clumps remain. Let chia green tea mixture gel for several hours to overnight. The result should be very thick and pudding like. This step is important, if you don't allow chia seeds to gel then the chia seeds in your final drink may not be evenly distributed. Combine thickened chia gel and pomegranate juice together in a pitcher and stir or whisk well until mixed thoroughly. Can also be made ahead of time. Makes 4 cups. Thanks for sharing Joscelyn. I’ve been looking for more ways to incorporate chia into my diet. This is a good one! This looks so good like seriously I want to make a pitcher. I love green tea with pomegranate but never considered chia seeds as a non-smoothie ingredient. Pomegranate green tea sounds so refreshing and delicious, Joscelyn. And the addition of chia seeds sounds like a wonderful idea. Can’t wait to make my own pomegranate tea. Oh my, this looks heavenly! And so good for you! Will have to try it sometime. Thanks, Kristie! I hope you have a great weekend! Thank you Harriet and thanks for the pin. Yeah, pomegranates are such a beautiful fruit and so delicious too! What an absolutely delicious drink! I tried it and couldn’t get enough! Thanks for another great share Joscelyn! This drink sounds and looks absolutely refreshing! Beautiful photos as always Joscelyn!!! Aw, thanks Quin! I appreciate your encouragement. I hope you are having a wonderful week! So yummy! I love ice tea with chia in it and the pomegranate is perfect for the season. What a great idea! Seriously, I’ve spent $$$ on these drinks at the store, but they’re so easy to make once you have the right ingredients. Pinning this to try! Thank you, Kelly! I appreciate you pinning this. I think you’ll really enjoy this drink.